Imagine your ideal neighborhood bar also doubling as a bodega, serving excellent sandwiches and playing sweet jams. A place that you'd love to sit at in a booth for hours and get some work done or meet some friends for coffee or a local brew. If this description sounds enticing to you, then Rhino Market and Deli is the spot for you. I'm embarrassed to say that I didn't make it to Rhino until almost a year after it opened. I went there on the suggestion of a coworker who lives in Wesley Heights. A group of us met up after work for a relaxed, late spring happy hour on Rhino's patio. Waiting that long to check out Rhino was a big mistake. I really didn't know what I was missing out on; a cool, casual spot perfect for gathering with friends and neighbors, with a side of good beer choices and really good sandwiches. The kind of place that is right up my alley. 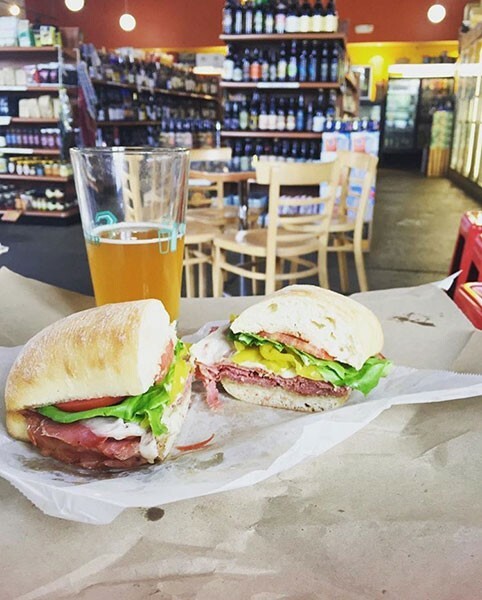 The few hours I spent at Rhino changed my life forever — it sounds a little dramatic, but beer and sandwiches can do that. Rhino went from not even on my radar to a place that I recommend for everything. Want to get a few hours of work done? There's plenty of tables and free Wi-fi at Rhino. Need a spot for a small group meeting? Brainstorm while you sip on some beer (and again, free wifi). Meeting a friend to strategize your fantasy football picks? Rhino is the perfect spot for lunch while you talk linebackers (yes, this happened in real life). Looking for a delicious, quick bite to eat? Rhino's sandwiches will satiate you. Speaking of sandwiches, the deli in Rhino Market & Deli sells some of the best in Charlotte. Their sandwich offerings will please vegetarians with choices like classic grilled cheese, the Tofu You (with BBQ tofu and pickled veggies) and Healthy Hummus, and also impress carnivores with classics like the Reuben, hot roast beef and chicken torta. Their interpretation of a classic Italian, called the Sicilian, is great whether served hot or cold, and is piled high with meats, cheese and some veggies. 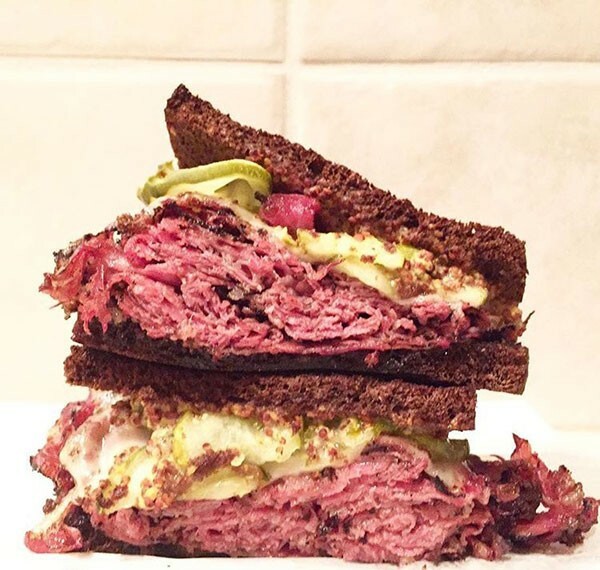 But my favorite is the Big Wheel: hot pastrami, Swiss, Creole mustard and sliced pickles served between slices of pumpernickel. It's a real beauty. Besides sandwiches, Rhino has a little bit of everything. Neighbors can come in and pick up loaves of locally made Duke's Bread and cartons of eggs. If you're looking for a quick and easy dinner, Rhino has a few coolers dedicated to Pasta and Provisions' premade pastas and sauces. If you want to skip a sandwich and prefer snacks, you can get your fix with some Queen Charlotte's Pimento Cheese Royale, Cardias Gourmet, goodies from The Naked Tart and sweet treats from QC Cheesecakes. Add to this a smattering of weekly events like trivia, beer and wine tastings, live music, DJs and an open mic night — and don't forget a pint of your favorite North Carolina brew, a glass of wine or a bottle or six pack to bring home. And if I haven't sold you already, Rhino serves breakfast until 11 a.m. on weekdays and noon on weekends, and I hear the breakfast burrito is not only affordable at $4.49 but also delicious.